The way AP operations are managed can pay off … or cost plenty. 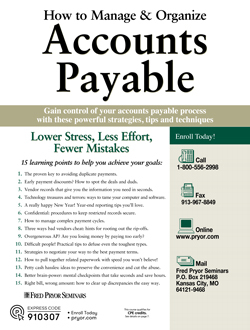 Take this accounts payable seminar to gain control of your work day. When it comes to time, resources and money, your AP operation is filled with opportunities for improvement … and this seminar shows you exactly how to tap into them! You'll learn how to conserve cash resources while keeping vendors satisfied. You'll discover dozens of tips for eliminating the typical time-wasters that deplete your workday. You'll explore ways to cut through the complexities of payment cycles, terms, vendor discounts and more, and you'll find out how to maximize company resources while minimizing the hassles! Powerful strategies help you gain control over your enormous workload, prevent errors and eliminate oversights. If you've ever felt like you'll never get ahead … if you're working double-time … if you're just hoping you haven't missed something — this seminar is just what you've been waiting for! Learn little-known tips and tricks to turn an unmanageable mountain of work into a smooth system that will keep you ahead … instead of perpetually behind! You'll master clever checks and balances to catch errors before they slip by. Discover the organization secrets of top AP pros — you'll be able to organize your files, records and workspace for maximum organization and flow. Invest just one day, and you're on your way. In just one day, you'll learn the "success skills" that would take years of on-the-job experience to learn on your own (not to mention the mistakes and slip-ups you'd likely make along the way)! Accounts payable training is a virtual "treasure trove" of information to help you in every aspect of your job. Make the decision to enroll today — invest one day and be on your way! The three-way, two-way and one-way matching systems: Which one is best for you? 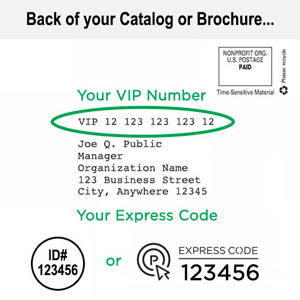 Streamline Your Expense Processing! Be sure your expense processes flow smoothly, day in and day out. How to stop those "I need a check today" interruptions once and for all! Stop Struggling with People: Gain everyone's cooperation, inside your organization and out. The Vendor/Supplier Relationship: how it's changing … and the price you'll pay if you don't change with it! Difficult people! How to deal with the difficult types you face, including Paper Paranoids, Phantom Managers, Ultra-Questioners, Demanding Vendors and more! Learn Insider Info from Experts! Use shortcuts, tips and tricks from top AP pros! Why suppliers will love doing business with you … how to ensure your valuable vendors are paid on time, every time! Defeat the "Paper Mountain!" Make a molehill out of your mountain of files and records.